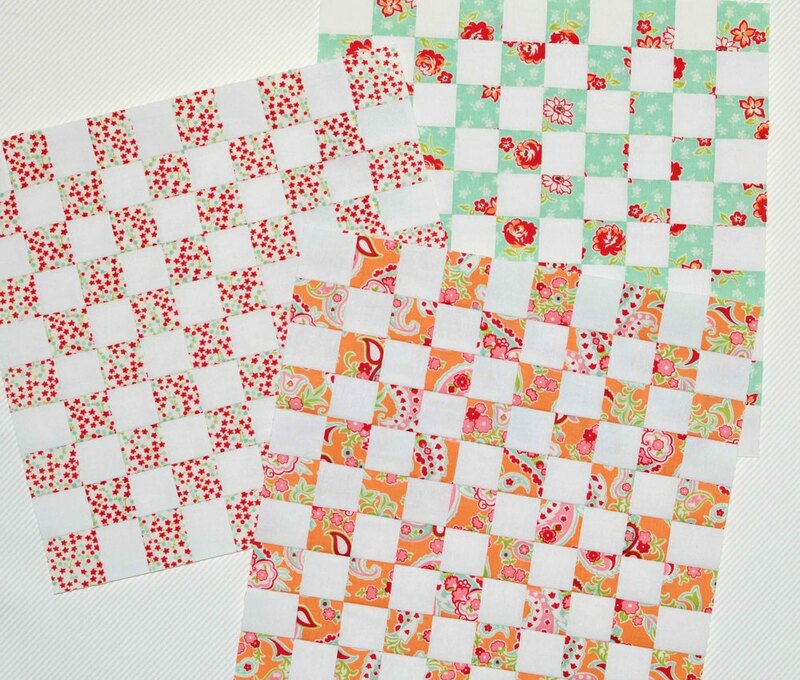 Remember the fat quarter bundle of Bonnie & Camille's Scrumptious fabric that I bought at Quilt Festival? (I know that you didn't forget about it!) I carried it onto the plane rather than putting it into my checked suitcase. I'd rather lose my clothes and shoes than my new fabric! Well, it didn't take me long to open it up and start cutting. I knew immediately what I was going to make! It's a 100 patch block as seen in the Sept/Oct 2014 issue of QuiltMania magazine. It was shown in deep, rich colors, but I knew that it would take on a much fresher look with lots of bright citrus colors. Each square is 1", with a finished block of 10". You won't believe how different this quilt can look with a color makeover. The big question was which background fabric to use. I considered the Scrumptious white-on-white bias stripe (you can see this in the background behind my blocks), but I only have a few yards in my stash, with no idea how much I'll really need. I have a whole new bolt of Kona Snow. Perfect! It's completely strip pieced, and each fat quarter will make two blocks. I have enough fabric to make this much larger than the pattern! I might add in some Miss Kate scallops (the "sundae" print) just because they're so cute, and they'll add another textural element. I'm also thinking that I might alter the pattern by adding some sashing, which would help to keep the focus on the fabric within each block. The blocks are super easy to sew, but they take me awhile because I use a billion pins to keep them flat. Just imagine this quilt in your favorite colors! I bought the QuiltMania magazine at a local newsstand, but it's also available here.